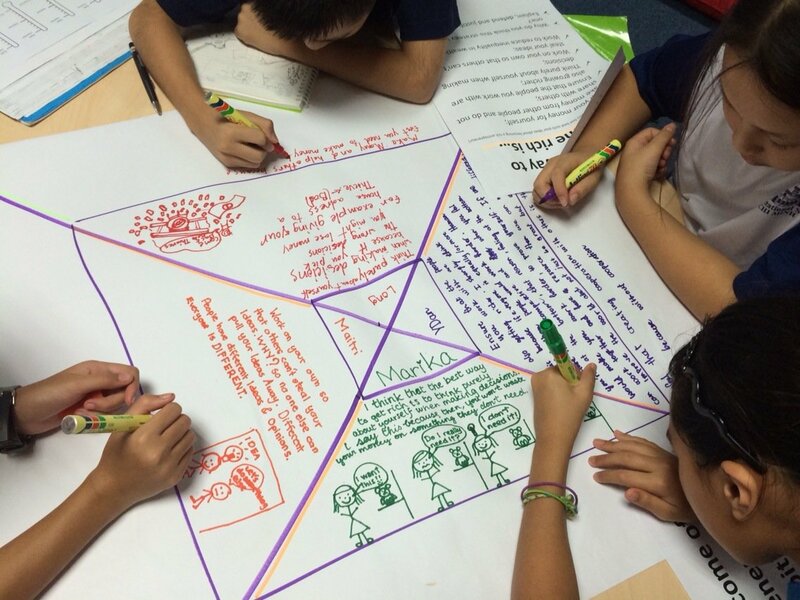 Using strategies to make thinking visible can be incredibly powerful. Their power, however, hinges almost entirely on how willing teachers are to learn about their students. Far too often, I see visible thinking strategies used as an “activity” or as a way of decorating the walls. In some cases, I think teachers believe that just by doing a visible thinking strategy they are automatically finding out what their students think and that by displaying the results their thinking has been made visible. However, in order to make the most of the opportunities that visible thinking strategies provide us to delve deep into the minds of our students, we need to be willing to scrutinize their responses. We need to be incredibly curious about the way they are thinking. We need to probe further when we’re not sure a student has responded fully. We need to try different strategies to see if different ideas are revealed. Most importantly of all… we need to be doing all of these things with them. By showing them how interested we are in their thoughts – and by involving them in the way we respond to their thoughts – we honour them, we give them pride and we let them know their thinking is important. By basing the subsequent planning – ours and theirs – on their responses and reactions, we show them how their learning is constructed… how it builds on their existing knowledge, their ideas, their misconceptions and their questions. So, next time you decide to use a visible thinking strategy, ask yourself if you are genuinely interested in how your students respond. If you are… great. If you’re not… try your hardest to make yourself interested. Its worth it. often meaningless to their learning. What a great opportunity to talk to the kids about their thinking and learning as it all unfolds in front of our eyes. Need to focus on having more conversations with my students re their visible thinking – my future goal. Spot on, Desi… the part about all of that marking that probably had little or no impact on student thinking is really important. Sam I couldn’t agree with you more. Making thinking visible is a window into where learners are coming from and where they are going to. We need to use this data to collaboratively plan the next step in their learning journey. I am increasingly coming to the same conclusion as you, that we should plan the “big picture”, the first few provocations and… nothing else! Once we start getting into our students heads and hearts, then we can plan the rest! Couldn’t agree more Sam, a good post and quite timely. Unfortunately visible thinking is for some just an “inquiry activity” that fills a space in the day and a space in the planner. I like it… fills a time (I changed that bit!) in the day and a space in the planner. Sam, I am really appreciating this post about the use of Visible Thinking Routines as an “activity” and to display them vs. 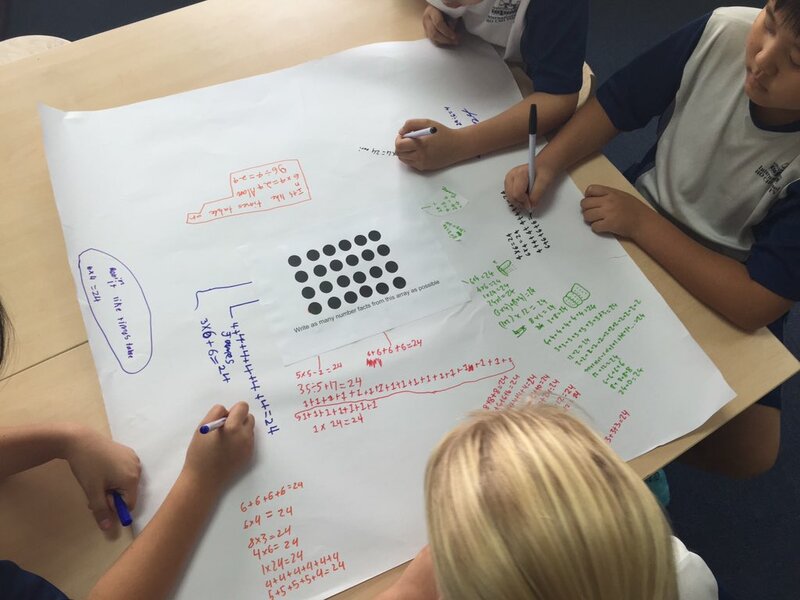 USING VTR to look at student thinking, connect students thinking to their learning, make decisions which thinking might be EVIDENCE of learning (or not) and to further inform what and how we will continue learning. VTR should be a component of a teaching/learning FLOW and not practiced as an isolated activity. Thanks Silvia… and yet it so often is an activity that goes unnoticed on the wall while the subsequent teaching remains unaffected! We have been studying the book, Making Thinking Visible as a staff. We recently conducted a PLC to discuss what we’re seeing and plan ways to get students digging deeper and synthesizing information. Each grade level shared strategies they used and made a plan for going further. It real time. In the process -not a result. I’d love to hear more about what your students doing in the pin image.